12.06.03. MOSKVA. KRASNAJA PLOQAD'. TORZHESTVENNYE MEROPRIJATIJA POSVJAQENNYE DNJU NEZAVISIMOSTI ROSSII. Foto Sergeja Velichkina. According to a new Levada poll, Vladimir Putin’s approval rating has dropped to 66%, its lowest level since 2013. Levada, the independent Russian pollster, has also published figures suggesting that only 39% of Russians trust Putin the most out of any politician, a significant decrease from last year’s level of 59%. The most likely source of this new decrease in popularity is Putin’s new pension reforms, increasing the retirement age of women from 55 to 60 and men from 60 to 65. The Russian state pollster VTsIOM found Putin’s approval rating decrease from 80% to 64% in the aftermath of these pension reforms. Despite this significant decrease in popularity, Putin’s approval rating remains astronomically high when compared to other prominent world leaders. In spite of Putin’s domestic popularity, 68% of Americans view him unfavorably, and 78% of Europeans lack confidence in him as a leader. While Putin is frequently criticized in the United States and Europe for human rights violations, autocratic tendencies, and brutal crackdowns on the free press, he remains very popular in Russia. Can history explain this phenomenon? A potential explanation for Vladimir Putin’s enduring popularity lies within Russia’s autocratic past. In 1833, Tsar Nicholas I, with the help of education minister Sergei Uvarov declared the triad of “Orthodoxy, Autocracy, and Nationality” as the official doctrine of Russian “Official Nationality”. In doing so, Nicholas I cemented autocracy as a fundamental tenant of what it meant to be Russian. The declaration of autocracy as being part crucial to Russia, was a concept that both preceded and succeeded the Romanov dynasty. Even during the “Time of the Troubles”, a significant period of political strife and succession crises preceding the Romanov dynasty, the autocratic system remained unchanged. Remarkably, most rebellions and revolts that occurred throughout the Russian history were focused on finding the true tsar rather than reforming the political system. In particular, the Russian peasantry, in general, firmly believed in the “myth of the tsar”, believing the true tsar to be a divine and benevolent ruler. The tsarist period was riddled with rebellions in the name of the tsar, but very rarely against the tsar himself and until the late 19th and early 20th century, certainly not Russian autocratic system. Both liberal reforming Tsars like Peter the Great and Alexander II and conservative tsars such as Alexander III and Nicholas II, were all united in their commitment to autocracy. Interestingly, the tsar himself was very rarely blamed for the people’s problems. The attitude emerged that the tsar’s true wishes were being distorted by the boyars or Russian nobility. In other words, the tsar’s rule was corrupted by those around him. This theory is evident in many popular uprising, which petitioned to the tsar directly, believing that if their words reached him, the benevolence of the tsar would ensure their demands were met. The October Revolution brought a new form of government to the Russian people; however, the cult of the leader remained similarly autocratic, particularly during the Stalinist period. 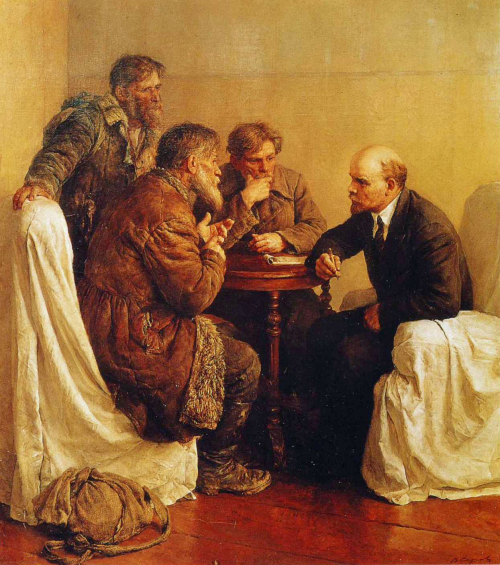 Lenin and Stalin’s leadership strategies coincided with the peasant ideal of a “strong leader”. The social support and attitudes towards Stalin’s rule were similar to how the Russian tsars were regarded. Maureen Perrie, in her article Popular Monarchism: the Myth of the Ruler notes that the myth of tsar factored prominently into Soviet attitudes towards Stalin’s Great Terror. The idea of the tsar as the “hostage of the boyars” was used to justify Stalin’s innocence. This powerful folk myth laid the blame on the people around Stalin– they had deceived him into believing that innocent victims of the purgers were guilty. 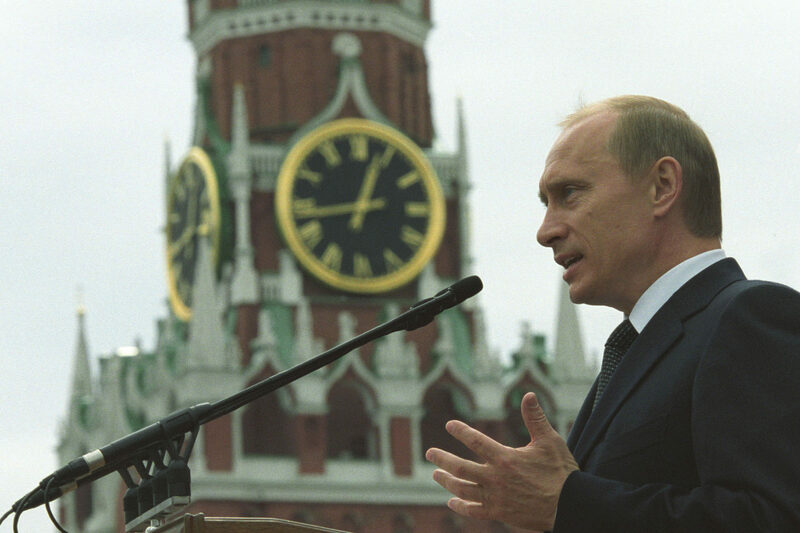 The idea of the tsar not being personally blamed for problems benefits Putin today. Interestingly, according to Levada, 65% of Russians believe corruption in government to be unacceptable, but 45% believe the most likely outcome to be “Putin will attempt to fight corruption but real success is unlikely, as corruption in Russia is incurable”. Only 6% of Russians believe Putin will not attempt to fight corruption because he is personally involved in it. It appears that the idea of the leader as a “hostage of the boyars” still exists today. Furthermore, only 10% of Russian’s find Vladimir Putin untrustworthy in comparison to 31% believing the government as an institution to be untrustworthy. This gap suggests that Russian’s are more inclined to blame the institution surrounding Putin rather than the President himself– similar to currents during the Romanov dynasty and Stalinist Russia. 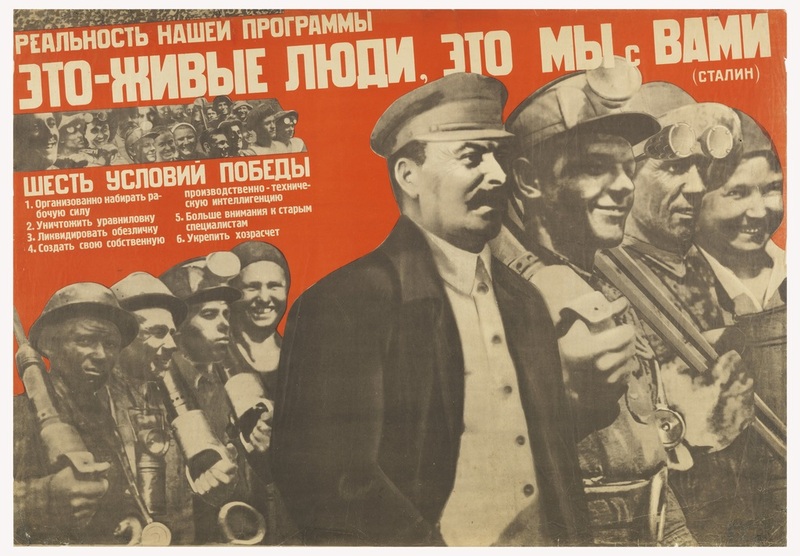 Both Lenin and Stalin attempted to portray themselves as champions of the peasants and common folk. The idea of popular monarchism and benevolent autocracy is one that has continued throughout Russian history and still exists today. A Russian polling organization, VTsIOM, found 68% of Russians to be against monarchy, but 22% were not against monarchy in principle. Rather, they did not think there was a person qualified to rule as a monarch. This is not to suggest that the Russian people want a return to Tsarism, but rather to show the historical impact of centuries of autocracy on Russia. 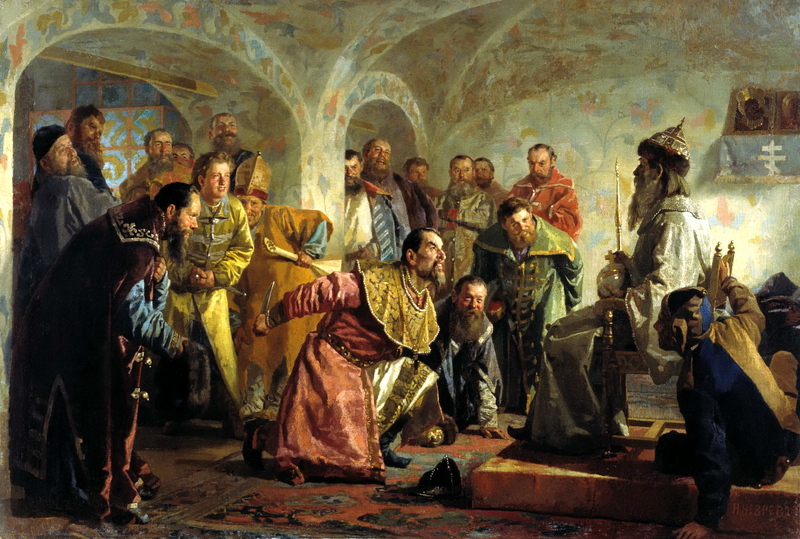 Nikolai Nevrev’s painting depicts Ivan the Terrible about the kill the treasonous boyar on his throne. Additionally, a Levada poll asked 1600 Russian’s to name “the most outstanding people of all time”. In the poll, Stalin finished first with 38%, with Putin, tied with Alexander Pushkin for second at 34%. It is most likely that Stalin finished first because of he is seen as the architect and leader of the Soviet Union’s victory of Nazi Germany in the Great Patriotic War, in spite of the Great Terror. Presently, Putin’s strength is derived from his perceived role in rescuing Russia from the economic crises of the 1990s and helping Russia retrieve power on the international stage. The myth of the tsar and the cult of the strongman help explain Vladimir Putin’s popularity today. In explaining the decline in Putin’s popularity, Andrei Kolesnikov writes, “The reason for the public outrage is that the proposal is a breach of Russia’s unwritten social contract, in which the government preserves so-called stability, maintains modest social benefits, and promotes feelings of national pride in exchange for the public’s political support and indifference to the rife corruption at the top of the political pyramid”. The problem is not Putin’s draconian rule or cronyism, it is the fact that Putin has not preserved stability. It is easy to see that Putin rules autocratically, but Russia’s history makes it easier for him and possibly popular for him to do so. This article by no means concludes that Putin’s popularity is simply a result of centuries of autocracy and a clamoring for the return of a strong tsarist leader. There are certainly other factors that explain Putin’s support, including Putin’s perceived strength on the international stage in the context of Russia’s distrust for the West. Additionally, it is unfair to blame Russian people for their own subordination to the tsar, to Stalin, and even today, to Putin. In the West, it is easy to portray the Russian people as enablers of a strict, violent government. In reality, it’s far more likely that Russia’s complicated and unique relationship with autocracy has created a susceptibility to governance by a ruler with autocratic tendencies.